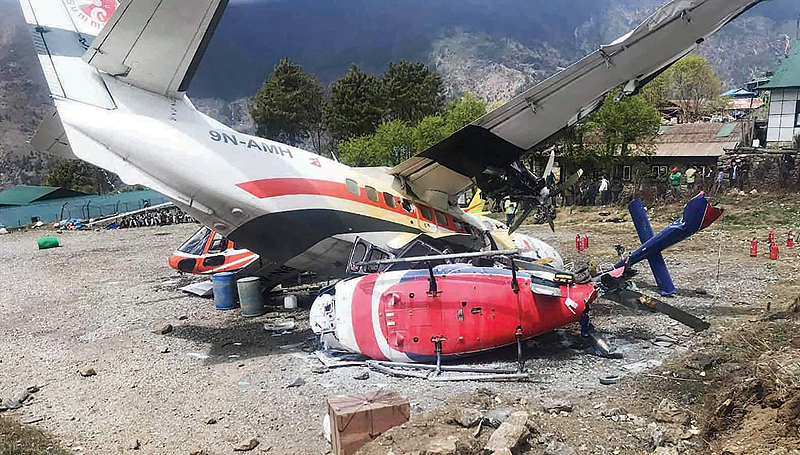 KATHMANDU: A small plane operated by a private airline in Nepal hit a parked helicopter yesterday while preparing to take off in a mountainous area near Mount Everest, killing three people including a co-pilot, an airport official said. The Twin Otter aircraft crashed into the helicopter at Tenzing Hillary Airport at Lukla, known as the gateway to the world’s highest mountain, 125 km northeast of capital Kathmandu. The plane, operated by Summit Air, was not carrying passengers as it was trying to leave what is considered to be one of the world’s most dangerous airports due to the shortness of its runway and its location surrounded by mountains. Officials said the cause of the incident was not immediately known. “Two people died on the spot and the third one died while undergoing treatment in a hospital in Kathmandu,” airport official Pratap Babu Tiwari said. The dead included two security guards who were near the helicopter. The pilot of the plane was among three people injured, though the lone stewardess escaped unhurt. Air crashes are common in mostly mountainous Nepal, home to eight of the world’s 14 highest mountain peaks, including Mount Everest.